Lost Prologue is the tutorial zone of Sonic and the Secret Rings (although you will sometimes see it referred to as Zone 0). The 21 missions here teach you various basic actions (The last 2 missions, 20 and 21, do not teach you any actions). The stage is set in an empty void, with Sonic running along pages of the Arabian Nights stories and some stones. 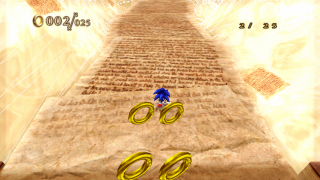 As Sonic is dragged into Arabian Nights, he appears in this zone where he learns some basic techniques. After completing the first 8 missions, he has an encounter with the Erazor Djinn, and is hit with the fire bolt while trying to defend Shahra. After this scene, he no longer returns to this zone during the story, although as he gets new skills more missions will unlock so you can practice these techniques. Note: All missions in this zone are listed in game as "Paragraph" (ex, Paragraph 01, Paragraph 02, etc.) As that tells you little about the mission, the descriptions given by the game are listed instead. Tilt the Wii Remote left and right and collect 50 Rings! Description: This level is simply running down a straight pathway, collecting rings, and dodging a few small obstacles. Tips: Set the language to Japanese to make the Shahra's speech at the start faster. You can also jump the frame after unpausing to move during this dialouge freeze. Use the Charge Jump move to reach the goal! To Unlock: Beat Lost Prologue 1. Description: This level involves lots of hurdles and staircases that you need to ascend. Use the Jump Dash move to reach the goal! To Unlock: Beat Lost Prologue 2. Description: The first section of this level contains a bunch of pits that you can jump dash over. If you fall in, use a charge jump to get out. The second section however has platforms floating over midair, so you need to perform everything correctly or die. Use Homing Attacks to defeat 10 Enemies! To Unlock: Beat Lost Prologue 3. Description: This level has a bit of everything: straightaways, hurdles, and bottomless pits. Just keep homing attack the enemies and you shouldn't have to deal with many of these obstacles. Use proper braking to reach the goal! To Unlock: Beat Lost Prologue 4. Description: This level is a thin path with 3 spikeballs rising up and down slowly. Brake before each one to let it pass so you don't get hit. Tips: Don't brake - Outspeed two of the spikeballs and jump straight over the third. Use back moves and collect 25 Rings! To Unlock: Beat Lost Prologue 5. Description: As you start the level, there is only one way you can go: backwards. Simply walk backwards and collect all the rings in your path. Use 10 small jumps and reach the Goal! To Unlock: Beat Lost Prologue 6. Use grinding to reach the goal! To Unlock: Beat Lost Prologue 7. Description: Near the start of this level, you are forced by the game to jump onto a set of rails. The rest of the level is a straightaway with these same two parallel rails (and a few springs on them). Tips: If you jump into the auto-jump at the start, then hold the direction opposite of the rail you are boarding, you can slip off it and simply run through this level, which is a lot faster with wind crest. Use Speed Break to reach the goal! To Unlock: Beat Evil Foundry 1. Description: The first section of this level is filled with big pearls to fill up your soul gauge. The second section is a straightaway for you to speed break on. Use Time Break to reach the goal! Description: The start of this level is the same as the previous mission. However, the second section is filled with fast moving spiked balls, that you need time break to weave through. Tips: You don't actually have to time break in this mission. An extremely well angled speed break will still pass and be a lot faster. Use Sliding Attacks to defeat 3 enemies! To Unlock: Reach level 21. Description: At the start, you have to slide under a large panel. Stay sliding, and if you have Volcano Slider equipped you will soon defeat three enemies in your path. To Unlock: Get 45 silver medals. Description: In this mission you have to kill three enemies surrounded by spikeballs. To do this, activate time break with the Slowed Search skill, and homing attack them. Tips: If you can down cancel off of the chest after the first enemy, you can cut precious centis, which matter a lot in such a short level. Use the Fire Gaze move and break 20 boxes! To Unlock: Reach level 17. Description: You are on a straight path with forty or so boxes. Simply break twenty of them with fire gaze to complete the mission. Tips: Be very patient, the game often does not recognize that you broke a box, even when you clearly did. To Unlock: Achieve level 34. Collect 10 Rings using Back Step! Splash Jump Practice Head for the Goal! Use Mini-Turbo and head for the goal! Perform a Rocket Start and reach the Goal! Use Warp Dash and head for the goal! Clear the stage as quickly as possible! ~Get the name of the background music and put it in the introduction. This page was last edited on 18 April 2018, at 18:11.